One of my routines when I visit the grocery store is to stop by the entrance where there are a bunch of free newspapers available for anyone who wants to take them. I usually wind up taking one of each. These newspapers cover the Des Moines area as well a a lot of the rural communities around Des Moines. They are perhaps the most useful resource available to me for finding interesting inexpensive and free things to do in my community and in the communities around where I live. A great example of this kind of free newspaper is Cityview, a free independent newspaper that’s been around the Des Moines area for a couple decades. They have wonderful local political coverage, a very long community calendar, and usually an interesting feature article or two every single week. What value do I get from reading these free local newspapers? They usually have a fairly robust schedule of upcoming events for the communities they serve. As I mentioned the other day, I usually use the internet to find community calendars for my local area. 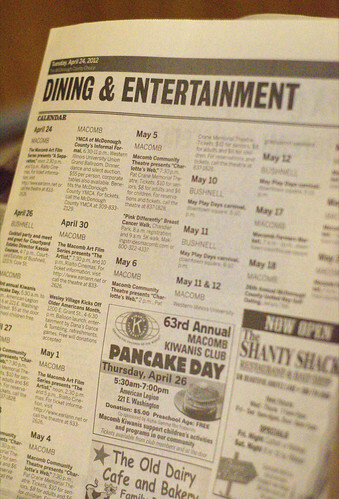 The calendars I find in local newspapers usually have some overlap with the ones I find online, but they usually have some unique items as well. Almost every time I leaf through a local newspaper, I find something interesting to do in the next week in either my own community or some community near mine. They’re often loaded with coupons for local businesses. Newspapers like these tend to be supported by advertisements coming from local businesses, and these businesses know that the people who read free newspapers tend to be the bargain hunters. Because of that, a very high proportion of the ads I find in free newspapers tend to have coupons attached to them. Because of these coupons, I’ve picked up some very inexpensive groceries, bought some gifts at a big discount, and I’ve even enjoyed some free meals. In fact, the last time I had work done on my Honda Pilot, I used a coupon from a local newspaper to knock some off the price. They cover community news, often in great detail. Free newspapers tend to be a pretty good source for information about the community, and not just the cover stories, either. I’ve found information on ongoing construction projects, notices of upcoming elections, auction notices, and lots of other little tidbits that I’ve found useful. In each of these cases, the local newspaper has either saved me time, made it easier for me to participate in the community, or saved me money by alerting me to something I didn’t know or had forgotten. Take a look at the free local papers for your community and surrounding communities. There is a lot of value between the covers.